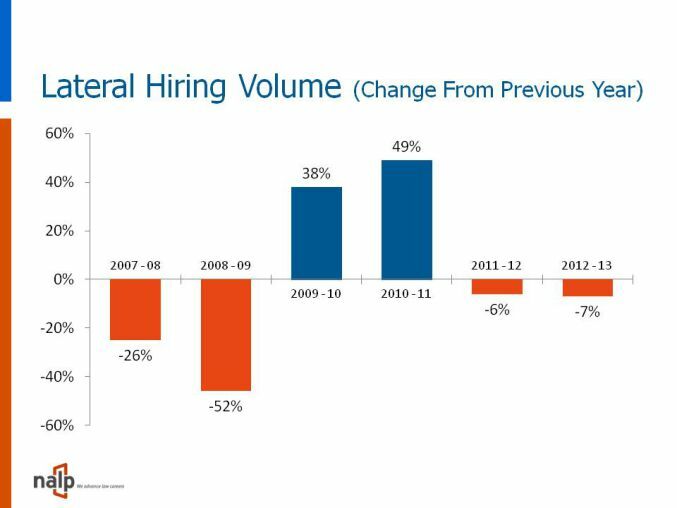 After two years of year-over-year double digit increases, from 2009-2010 and again from 2010-2011, aggregate lateral hiring has now declined for the second time in a row from 2012 to 2013, finishing out the year just over 7% lower than in 2012. That was the overall finding about lateral hiring from NALP’s 2013 “Survey of Legal Employers on Fall Recruiting,” which requested information on lateral hiring in 2012 and 2013. This follows a 6% decline from 2011-2012. In the previous two cycles (2009-2010 and 2010-2011) aggregate lateral hiring was up by 38% and 48%, respectively. The results shown in the first two tables accompanying this article are based on reports from 464 law offices that reported at least one lateral hire in one of the two years. Table 1 reports aggregate information not only for partners and associates but also for two additional categories of lateral hires: lawyers who may generally be eligible for partnership (typically counsel, of/ counsel, or senior attorneys) and lawyers who are generally not eligible for partnership (typically staff or contract attorneys.) Table 2 reports on lateral partner and associate hiring, which accounted for 80% of the lateral hiring reported, and includes cities with at least five offices reporting office-specific information and collectively reporting at least 25 lateral hires in 2013. 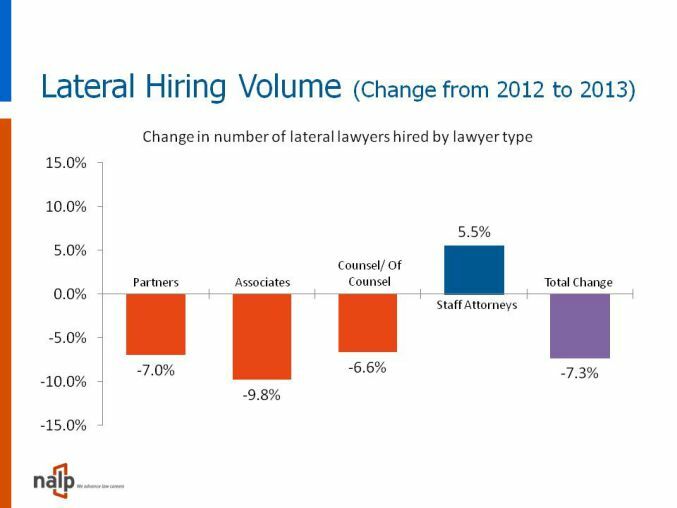 Overall, based on aggregate hiring of over 5,100 lateral lawyers in 2013, the volume of hiring was off by 7.3% compared with 2012, with a median of 5 and an average of just over 11 lateral hires (Table 1.) Much of the decrease was driven by a decline in lateral associate hiring, which accounted for 58% of lateral hiring in 2013, and where aggregate hiring was off by almost 10%. The categories of counsel/of counsel and staff attorney accounted for just 20% of lateral hiring in 2013, and as the median figures suggest, the majority of offices did not do any hiring of this type in 2013. However, in contrast to other categories of lateral hires, aggregate hiring of lateral staff attorneys increased by over 5%. Among offices reporting activity for a single office, offices averaged 1 or 2 lateral partner hires depending on firm size, whereas associate lateral hiring averaged between 3 and 4 per office at all but the smaller firms. On a regional basis, the level of lateral hiring per office was highest in the Northeast, with a median of 8 and an average of about 10 lateral hires in 2013, and lowest in the Southeast and West/Rocky Mountain Regions, where the median number was 3 and the averages were 3.8 and 4.4, respectively. In terms of changes in aggregate volumes, however, it was closest to steady in the South, reflecting in part double-digit increases in Charlotte, Dallas, and Houston, mostly at the partner level, but at much smaller volumes than in the Northeast. Among larger cities (those reporting at least 50 lateral hires) only Boston, Philadelphia, Houston, and Seattle registered increases in aggregate hiring, and increases occurred among both partners and associates only in Dallas and Seattle. Seattle thus is in contrast to other larger cities in the West/Rocky Mountain Region — San Francisco, Los Angeles, and San Jose — all of which registered declines. Despite the overall decrease, of course not every office or firm hired fewer laterals in 2013 compared with 2012. In fact 40% of offices hired more laterals in 2013 than in 2012, and 10% hired the same number overall. The last column in the table shows that half of offices met or exceeded the average 7% decline. Among cities with at least 10 offices reporting, this percentage was highest in New York, Miami, Chicago, and San Jose and lowest in Boston and Houston. Source: NALP 2013 Survey of Legal Employers on Fall Recruiting. This table includes offices/firms that reported at least one lateral hire in 2012 or 2013 and which also reported complete information for both years. Collectively these 464 employers reported 5,160 lateral hires in 2013. Cities shown had at least 5 offices/firms collectively reporting at least 25 lateral hires in 2013. Following the overall total shown in the first line, the table separates out surveys that reported information firm-wide, or for multiple offices, from those that reported office-specific information. Firm-wide information by region includes firms whose offices are predominantly or wholly in that region. However, office-specific information includes some instances of firms with most attorneys located in that city or whose additional offices are located primarily in adjacent areas, and of multi-office nationwide firms consolidating two geographically adjacent offices onto one survey.